Joseph D. Law is director of NASA Idaho Space Grant Consortium, director of Idaho NASA EPSCoR, and an associate professor of Electrical Engineering at the University of Idaho. 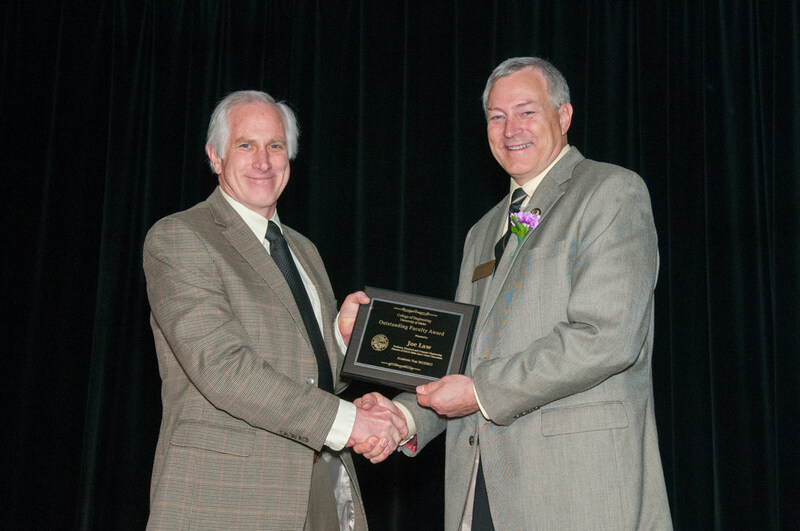 He earned a bachelor's degree in electrical engineering from the University of Idaho in 1981 and master's and doctorate in electrical engineering from the University of Wisconsin-Madison in 1985 and 1991. He is a licensed Professional Engineer in the State of Idaho. 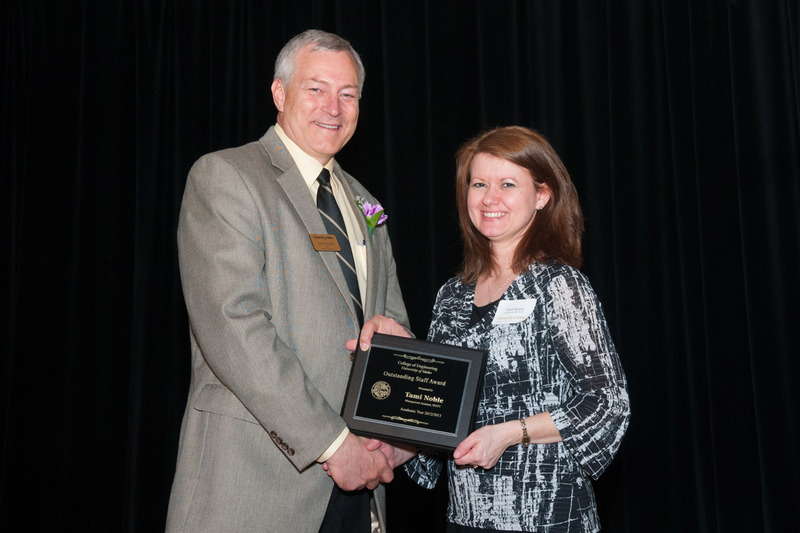 Law has been recognized with many awards for excellence in teaching and dedication to mentoring students. He is passionate about recruiting underrepresented groups into engineering. In collaboration with other college faculty he created an interdisciplinary two-semester capstone design course that is now required of all agricultural, biological, computer, electrical and mechanical engineering and computer science students at the University of Idaho. Law’s research has focused on increasing the efficiency and reliability of energy conversion, transmission and storage systems. Currently, he is the Science Principal Investigator on a NASA Steckler Phase II research grant that is developing integrated flywheel energy storage systems. 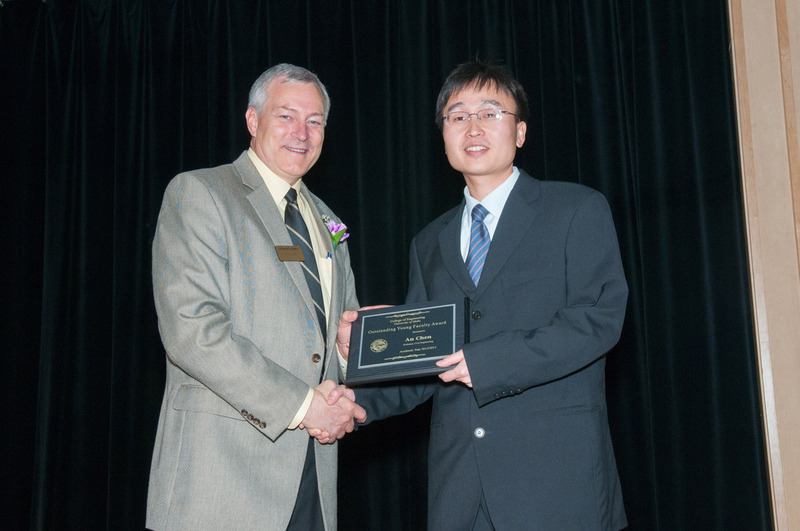 An Chen joined the Department of Civil & Environmental Engineering at University of Idaho in 2011. His teaching interests focus on structural engineering. His research area is on green buildings and sustainable civil infrastructure covering energy efficient structures, bridge engineering and theoretical study. He is a practicing and licensed Professional Engineer and had extensive industrial experience on building design. He is also a Leadership in Energy and Environmental Design Accredited Professional (LEED® AP) and familiar with LEED Rating System and green building design. 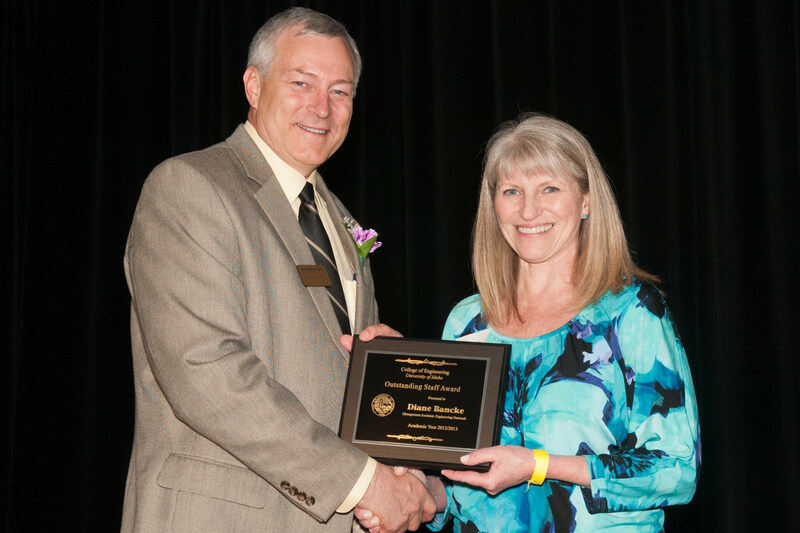 Diane Bancke moved to Moscow from the Portland area in 1989 and began working at the University of Idaho as a senior secretary at the Tutoring and Academic Assistance Center. She has been with Engineering Outreach for the past 18 years where she is a member of the EO management team and serves as the office manager. Diane enjoys gardening, reading and motorcycle rides with her husband Jim. Debbie Foster earned an associate’s degree in bookkeeping from Lewis Clark State College and a bachelor’s in office administration and minor in accounting from University of Idaho as well as having over 16 years of experience working at the U of I. She has worked in the National Institute for Advance Transportation Technology since June of 2003 as a Finance Technician and has also been performing financial related duties for the College of Engineering Dean’s Office since December of 2011. She enjoys working with multiple budgets and performing a wide variety of financial duties. When not at work, she enjoys reading, watching movies and spending time with family and friends. Tami Noble is the assistant to the director of the National Institute for Advanced Transportation Technology (NIATT). She has been with NIATT for three and a half years and prior to that was with the Civil & Environmental Engineering Department for four years. She has multiple strong skills in financial management and in working with people. Her knowledge of administrative requirements helps the center stay afloat in a sea of forms and procedures. She takes great pride in providing support to faculty and staff and is always willing to go the extra mile when needed. 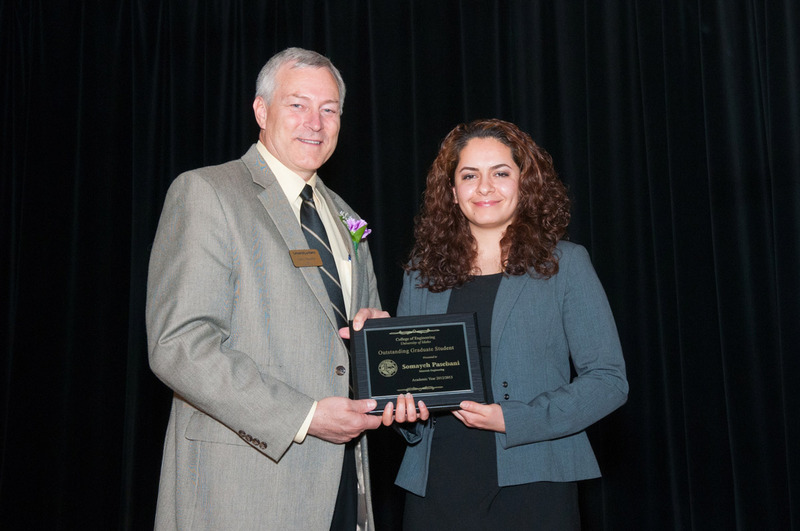 Somayeh Pasebani is a doctorate student in Materials Engineering at the University of Idaho. Her major professor is Indrajit Charit. She was born in Tehran, Iran and graduated in Metallurgical/ Materials Engineering from Isfahan University of Technology at 2009. She then applied for her doctorate in 2010. Her research is to design novel ways of processing oxide dispersion strengthened steels using mechanical alloying and spark plasma sintering techniques. It will have significant implication for the development of advanced materials in various energy applications such as next generation nuclear reactors. 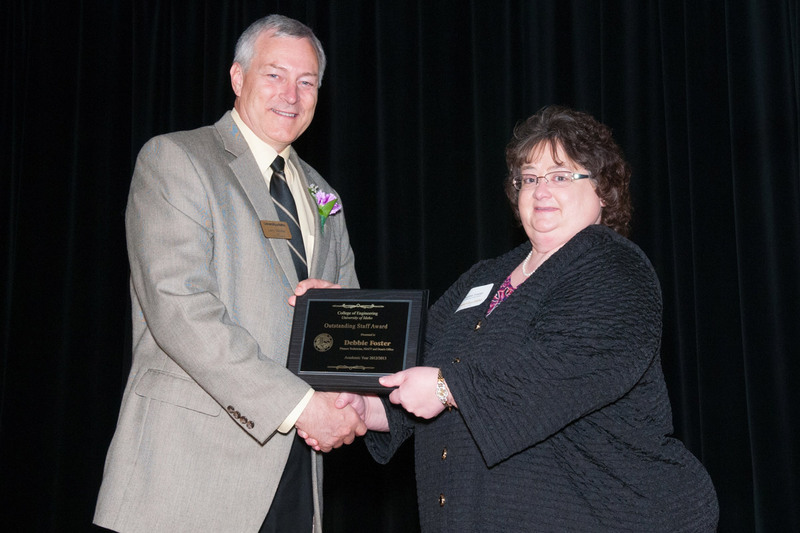 She says that she is so honored to be recognized as the Outstanding Graduate Student. This prestigious award will definitely encourage her in working harder and producing higher quality results! 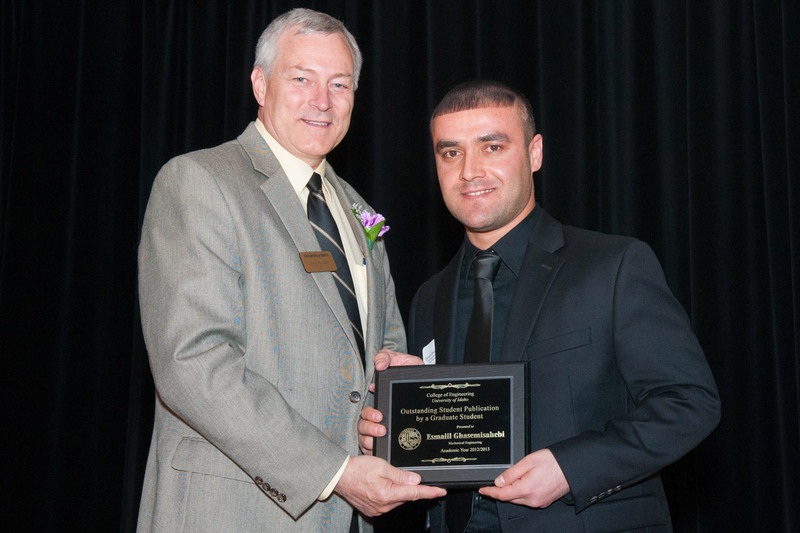 Esmaiil Ghasemisahebi received his bachelor's in mechanical engineering with an emphasis on thermofluids at University of Mazandaran in Iran. 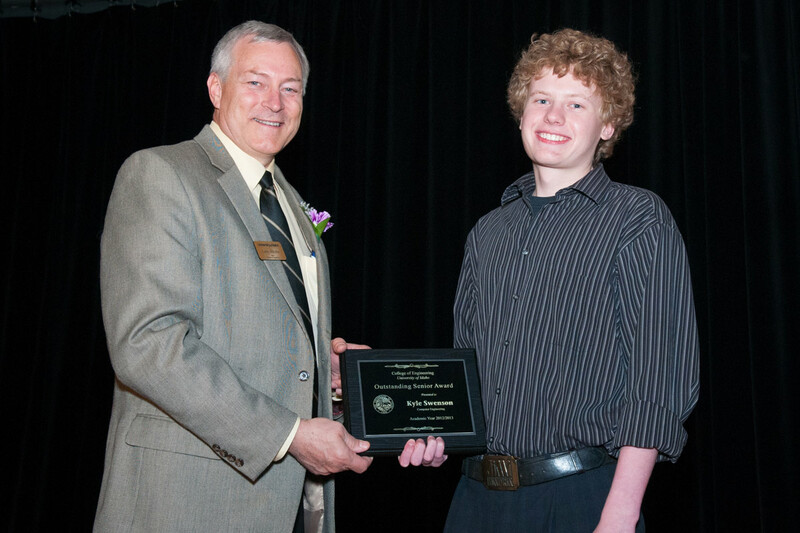 He is currently a graduate student in Mechanical Engineering at the University of Idaho in Idaho Falls. 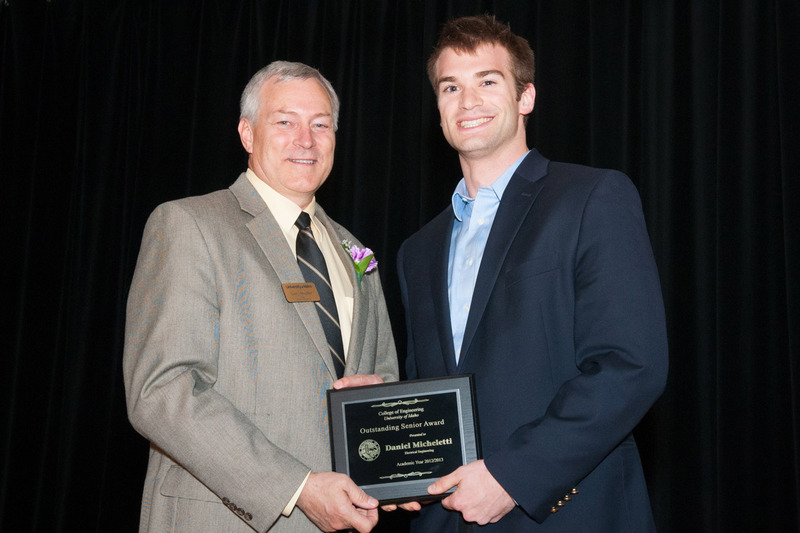 He performs research on 'entropy generation in transitional boundary layer region' under a US DOE NEUP project. His main research interests are computational fluid dynamics and computational physics, turbulent flow modeling, heat transfer and entropy generation. Chris Baker began his college career at ISU and then went to Australia to play professional basketball. While there he started his own drywall business. Tough economic times meant a career change. He applied at the Idaho National Lab and got hired as a stimulus hire for CWI and began attending the University of Idaho to finish his degree. He is currently at INL as a fuel handler at FAST. Full time school and work have been a sacrifice for Chris and his family. He is grateful for their support and he is proud of his wife and kids for their own accomplishments. He is looking forward to spending more time with them now that his degree is completed. 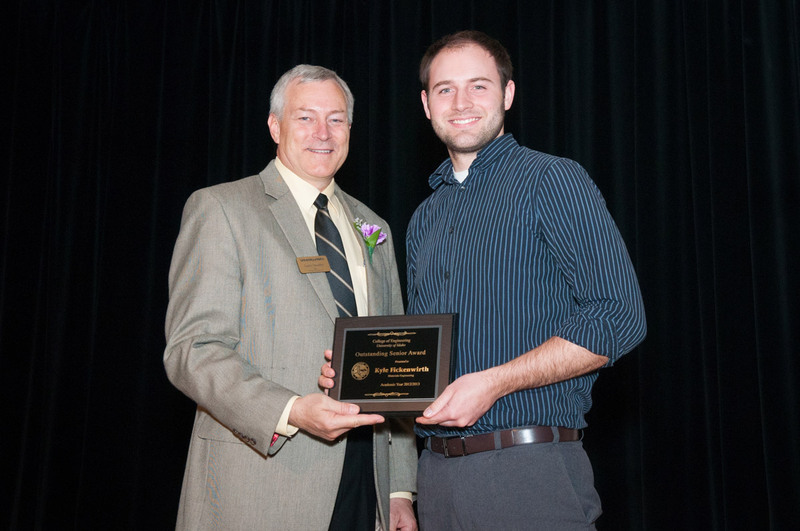 Originally from Gooding, Idaho, Jacob Bow is now finishing his degrees in chemical engineering and mathematics. 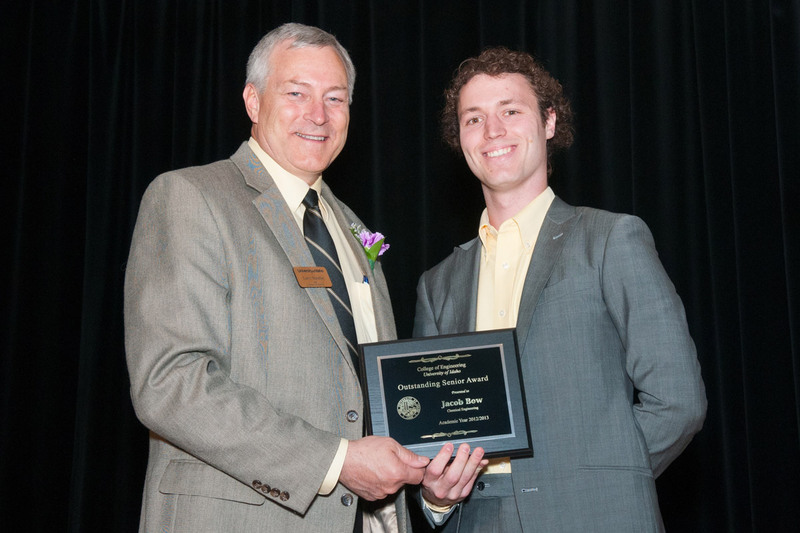 During his time at the University of Idaho, He has had the privilege of being involved in research in Chemical Engineering and Physics, and to be a part of the university's excellent honors program. Beginning next year, he will be pursuing a doctorate in materials science. Cody Clark-Cline is an active member of his fraternity (Phi Gamma Delta) and regularly participates in intramurals. He is from the small town in the Silver Valley (Wallace, Idaho), where he volunteers during the summers as an assistant coach for the Silver Valley's American Legion baseball program. He is engaged to his high school sweetheart and they plan to tie the knot at the end of the summer in 2014. He is a very motivated, trustworthy and intelligent person and is looking for a company with which he can grow. Cody is excited to graduate in the fall of 2013. John Feusi is from Boise, Idaho. He is currently working on a test-bed for a doubly-fed induction generator for his senior design project. In his spare time he also helps conduct research on autonomous underwater vehicles. After graduation he hopes to attain a position working on control systems. He would like to thank all the family, faculty and friends that have made this possible. Thank you. 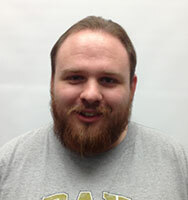 Kyle Fickenwirth will be graduating in May of this year with a degree in Materials Science and Engineering. After graduation, Fickenwirth plans to pursue a career in engineering with an emphasis in Process and Manufacturing Engineering. His hobbies include working on cars, snowboarding and spending time with his wife and 11-month-old daughter. Grant Howard grew up in Cloudcroft, New Mexico, attended the University of New Mexico for a year and dropped out. He enjoyed Moscow when traveling through the town on a road trip several years later, and when he decided to finish his degree he enrolled at the University of Idaho. He will graduate in a few months with a double major in chemical engineering and biochemistry. After graduating Grant will pursue a doctorate in chemical engineering at UT Austin. He hopes to perform his research in biomolecular engineering, and he intends to later pursue a research-oriented career in academia or commercial research and development. Kurran Kelly grew up in Buhl, a small town in southern Idaho, where his family raises cattle on their farm. He spends his free time hunting, enjoying the outdoors, snowboarding, working on classic cars and spending time with his friends and family. He spent last summer as an intern at Boise Paper – Wallula Mill in Wallula, Wash. near Tri-Cities, and before that spent his previous seven summers working on a dairy, building vinyl fence, and working for the U.S. Forest Service. After graduation Kelly will spend the summer with family and then travel to San Diego, CA for his Senior Design Competition at the SSC Pacific TRANSDEC Center in Point Loma in late July. In August, Kelly will be moving to Anchorage, AK to begin his career as a Surface Engineer working for B.P. Exploration Alaska. Daniel Micheletti was born in Bloomington, Illinois, and moved to Meridian, Idaho, when he was 10 years old. He was a varsity athlete and valedictorian at Mountain View High School before choosing to pursue a degree in electrical engineering at the University of Idaho. He continued to play football for U of I as a wide receiver for three years, before leaving the team to focus on his studies. He plans to further his education by attending graduate school, choosing to focus on mixed signal analog circuit design. He hopes to one day design implantable integrated circuits for medical solutions. Gage Parker grew up in St. Anthony. As soon as he could he moved to Idaho Falls and enrolled in Eastern Idaho Technical College's Computer Networking program. He took an internship with EITC and they liked him enough to hire him just after he graduated. He has worked at EITC now for over five years as a systems administrator. Two years ago he decided to go to the University of Idaho to finish off his bachelors. He worked and attended school full time at night and during the summer and was able to graduate December of 2012. He only had his degree for about month before he was able to secure a job at BSU. 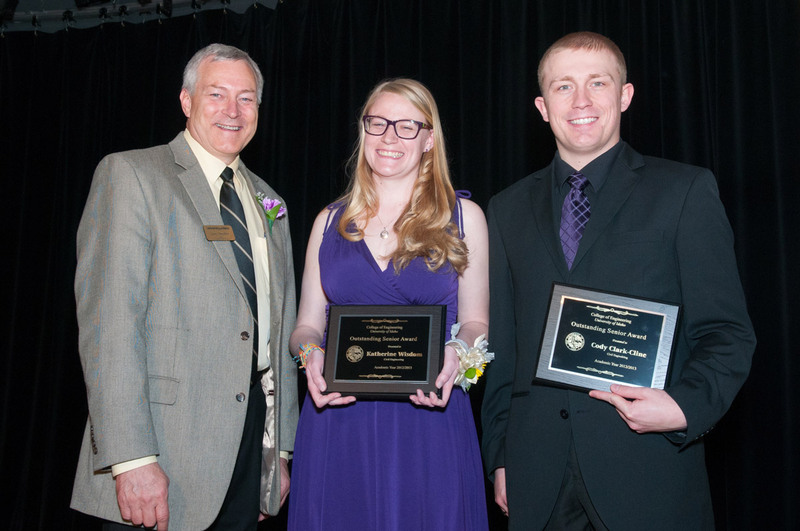 Cailin Penberthy is an environmental engineering student in Biological and Agricultural Engineering. 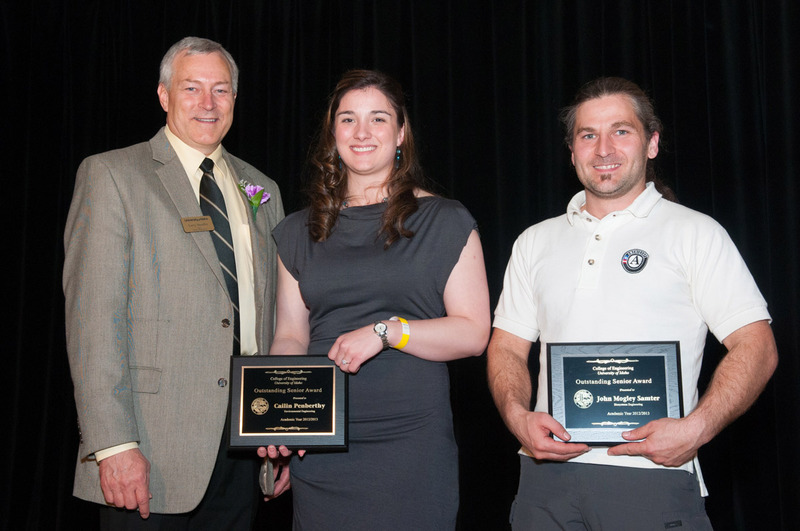 She has been working at Schweitzer Engineering Laboratories as an engineering intern for the last year. When she graduates this May, she will begin her full-time position as automation engineer at SEL. And to top off this exciting year, she will be getting married in June! John Mogley Samter grew up in North Idaho playing the violin, running around the mountains and spending as little time doing schoolwork as possible. He has spent the last few years working towards his biological systems engineering degree while simultaneously volunteering with the Extension 4-H Robotics program as a full-time Americorps member. He is looking forward to having a bit of free time after graduating to finish his Americorps contract and engage the dilemma of grad-school versus work. Mike Solomon works at the startup MindSnacks in San Francisco. 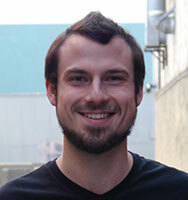 He graduated in December 2012 and shortly after moved to California to be a software engineer. 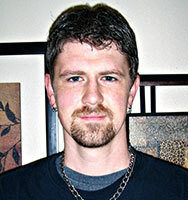 He enjoys programming, photography, soccer and role-playing games. Kyle Swenson grew up in Boise, Idaho and graduated from Boise High School in 2009. He has always had a strong interest in science, math and computers, which later matured into a passion for programming and digital systems engineering. Swenson loves working with FPGAs and microcontrollers and designing complex systems. 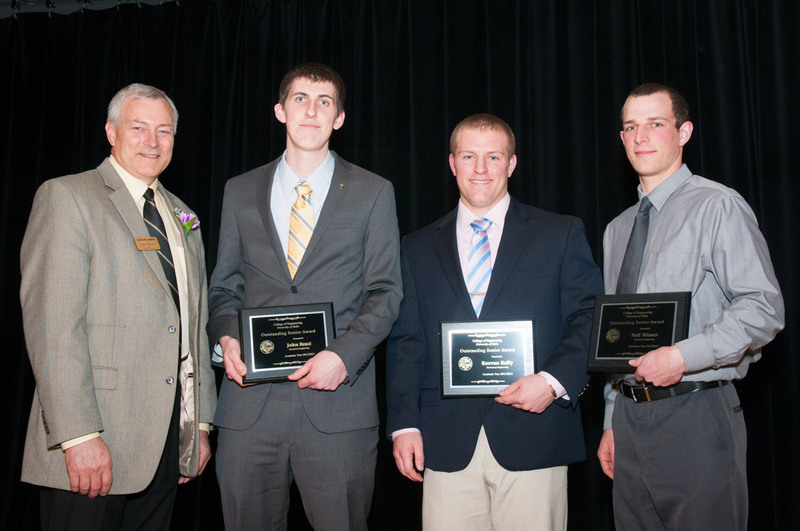 After graduate school, Swenson plans on implementing embedded control systems with sensor networks. He intends to start his own business in embedded system contracting after working in the industry for a few years. Swenson has always been interested in learning more about himself and the world in which he lives, in an effort to grow as an individual and make the world a better place. Neil Wimer says that living in Moscow for four years has added many experiences to his life. To name a few, he started his sophomore year by joining the Moscow Volunteer Fire Department, soon after he married his wife Catherine and they had their son Henry during their junior year, and they are now looking for where life will take them next. He is currently pursuing a career designing heavy machinery such as mining, construction and forestry equipment. He is also interested in pursuing a career in renewable energy such as solar thermal, hydrokinetics and geothermal. Katie Wisdom has a bachelor's in mathematics and music from St. Olaf College and will receive a bachelor's in civil engineering in December, 2013. She intends to pursue a career in structural engineering and is excited to discover where the job market takes her!